Are you old enough to have lived through jukeboxes, cassette tapes, and at least one political dynasty? If so, you probably have in your possession a tech relic that can enjoy a second life as a picture frame and secret stash spot! By the early 1990s, most middle-class homes had a VCR. Video rental stores sprouted up like dandelions, taking over strip-mall storefronts everywhere. But thanks to Netflix, Hulu, and other online streaming platforms, VHS cassette tapes are now an endangered species. Like calculators and fax machines, they’ve been slowly disappearing from the landscape of our homes. But before you toss the last of your plastic videocassette cases, listen up! These throwaway containers can double as photo frames—and could be perfect for hiding your home’s most valuable possessions. Finnish home design blogger Heidi Lehto repurposed one of her own cases as a piece of wall art with hidden storage, and we’re glad she did! 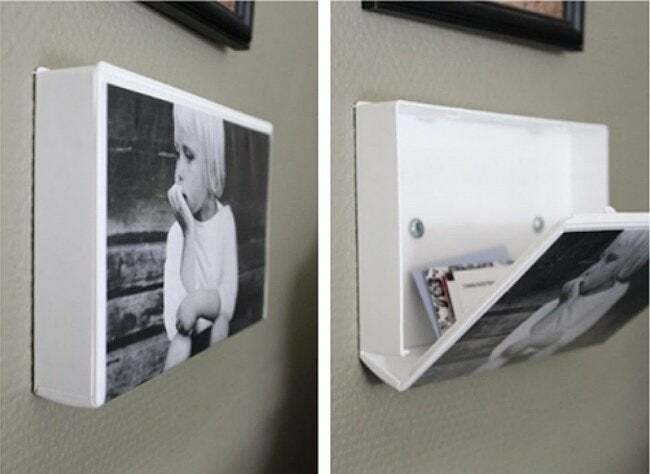 Replicating this sneaky storage is as easy as hanging up any other photo. Open one up, remove the tape, grab a screwdriver, and use two screws to mount the back of the plastic case to the wall. Then, replace the movie’s title insert in the clear outer flap with a picture of your choice. The tape case is about the same thickness as the standard wall canvas, but hollow; with the tape removed, you’re left with an unassuming stash spot—a perfect fit for important documents, jewelry, or other small valuables you want to keep out of sight. And if you’re an indecisive decorator or a homeowner who regularly rotates artwork, you’ll love the option to switch out the front display.